Without any doubt at all, it is the Death Tarot Card that causes most fear in a reading however strangely t it rarely ever symbolizes actual death of you or someone else. This tarot card is more a time of absolute endings and absolute beginnings. While The Death Tarot Card can represent shocking or unexpected events or changes, these events and changes usually clear the way for a new start. This translates to a greater value for life itself. If you were unaware of this I am sure you find it nice to know! One door closes while another door opens. This is a time of transformation and brings another way of looking at this ominous tarot card. Negatively there isn’t much difference however. Obviously you may have a greater sense of fear and dread when this card appears. Do not fear however, for it’s a time and signal that is time for you to show life what you are made of. 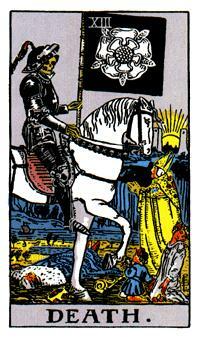 One negative aspect of The Death Tarot Card that you must watch out for is stagnation. This resisting of change when change is essential very often will lead you to lost opportunities. Certainly a card to discuss at greater lengths with your reader!